Some of these bits are daily essentials and others are just a little treat that I snapped up because they were on offer! I'm still on a slight spending ban due to my holiday so I can't quite splash out like I used too on beauty products but still... a girl has to buy some things right? First up are these bits from the Boots Essentials range. If you've been reading my blog for a while you would have seen a few products from this range mentioned before (3 minute mask & the eye gel). Because of the success I had with those when I saw these on offer 3 for £3 I thought I why not pick up some more of these cucumber beauties to try out! I've gone for the scrub, facial toner (because I've run out of my Liz Earle Skin Tonic) and the face wipes... which actually I just find handy for using when I'm taking blog photos of products, getting lipstick swatches off etc! Next we have some everyday essentials. The No7 hot cloth cleaser was in my most recent favourites post. I love it so much I had to invest in another bottle and seeing as I have a £5 off No7 voucher it seemed like the perfect time. I've been loving using sensitive shower gel's recently, they seem to have really helped my skin and dry patches.... and they are alot cheaper than buying Soap & Glory every month! 99p for this Nivea one.... I love love love everything Nivea! Lastly the new Aquafresh HD toothpaste - I try out new toothpastes monthly and have been wanting to give this new one a go for a few months now and it was on offer so... hello and welcome to my home toothpaste! NOT pictured - Fab pink comb.... mine seem to have all gone missing so had to grab a new one - and what better than bright pink! Love using these to backcomb at the roots and give my hair a bit of oomph! Summer is here and so is the new Barry M collections! I had been looking at this Matte shade for days umming and arring whether to buy it and I finally caved in and popped it in my basket! This is Waikiki and it is a Matte lime green, perfect for summer and perfect to wear with a hot tan! Can't wait to try it out! Lastly it's an aray of Montagne Jeunesse face masks! Over the last couple of months I've been going sachet to sachet of this brand trying out everything I can and when I saw these were just £3 for 4 I had to pick up some newbies! I went for .... Hot Spring Sauna, Nut Oil Masque, Black Seaweed Peel Off Masque & Hot Chocolate. I'm going to try one of these once a week ..... and I'm sure I'll be letting you all know how I get on! 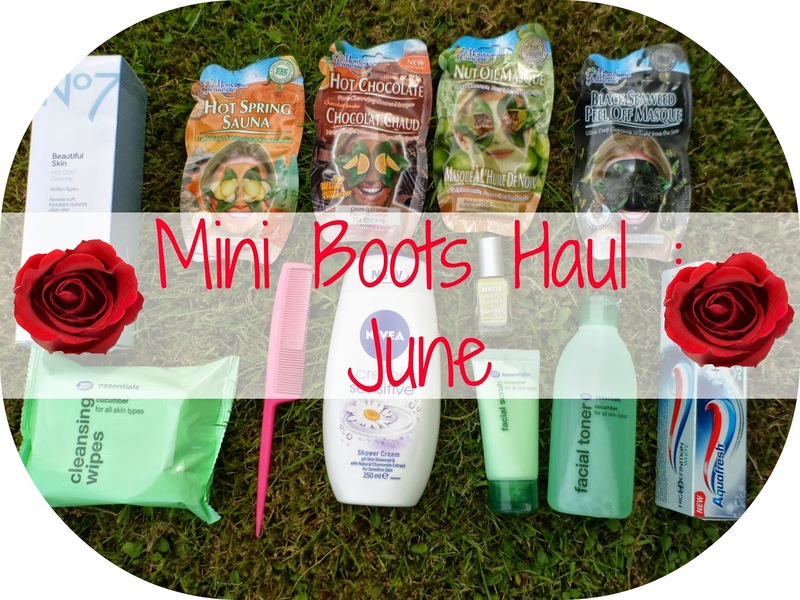 What have you all picked up in Boots recently? I must try some of those face masks. Have you noticed any difference in your skin since using them? I'd love to hear how you find the face masks! I'll have to check out the new Barry M colours when I go to Boots. I've only recently tried Montagne Jeunesse masks after years of assuming they were cheap and passing them by. I'm actually really impressed with them, behind their cheap and cheerful packaging and budget price tag actually hide some really great formulations. I think im a bit obsessed by them at the mo! I'm addicted to those face masks, I saw a coconut one in Asda today and I was like a child with my excitement...cringe!